“Which gate is the best for me?” Obviously, this is a common question among consumers. Not all of them are suitable for all properties for the sole and extremely important reason that they open in a completely different way. This is the reason why there are several gate types in the market and one must be particularly cautious when making a choice. New gate installation requires good knowledge of the size of one's property. You must also know whether there's any space for the ones opening outwards. When you don't take such parameters into consideration, you might end up with an unsuitable product that will only make your life difficult and won't be practical at all. So, let's consider the special characteristic of the main types. Rolling gate systems are perhaps the most common ones since they just need space in the side parts along the fence. They are also called sliding gates and since they use tracks to guide the sliding gate wheels back and forth, they might be also called v-track gates. A similar option is the cantilever type, which does not use sliding gate rollers but gets its balance from a long rail, installed across the fence. It actually hangs from the rail but must be at least 50 percent larger than the actual gate opening size in order to support its movement and stability. 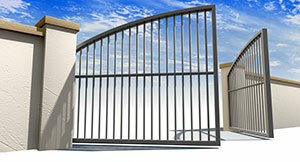 If you have enough property space, swing gates are also an option. They open inwards or outwards with the help of the swing gate hinges and they might have a single leaf or double leafs. Single leaf ones will demand more space and you must take proper safety measures to prevent accidents from the moving panels. Limited space will require overhead gates, which will open vertically up high and so they must have tall support pillars at each opening side. Vertical pivot lift systems open upwards from one side and the panel stands vertically to the opposite side part. They often use springs and two entrapment systems for protection. Bi-folding ones come in pairs and each double leaf hinged panel folds as the system is activated. They are practical for properties with limited space but need extra safety systems.